Soldiers from the 3rd Armored Brigade Combat Team (ABCT), 4th Infantry Division, hosted multinational medical evacuation training at Hohenfels Training Area, Germany, in preparation for a two-week combat training center rotation that’s part of Combined Resolve VIII. Soldiers from Romania, Ukraine, Albania and Hungary joined in learning how to load casualties onto each country’s tactical vehicles, including hot and cold loads onto helicopters. “We are familiarizing ourselves and soldiers from other countries on our medevac capabilities,” said Sgt. 1st Class Christopher Howard, the senior combat medical specialist for Headquarters and Headquarters Company, 3rd Armored Brigade Combat Team. The soldiers are among more than 3,400 participants from 10 nations participating in the U.S. Army Europe-led Combined Resolve VIII, which primarily exercises U.S. Army Europe’s regionally allocated forces taking part in Operation Atlantic Resolve by providing a complex scenario focused on multinational unified land operations. Other medical platforms used during the training were an M113 medical evacuation vehicle, and the Hungarians brought medevac vehicles as well. 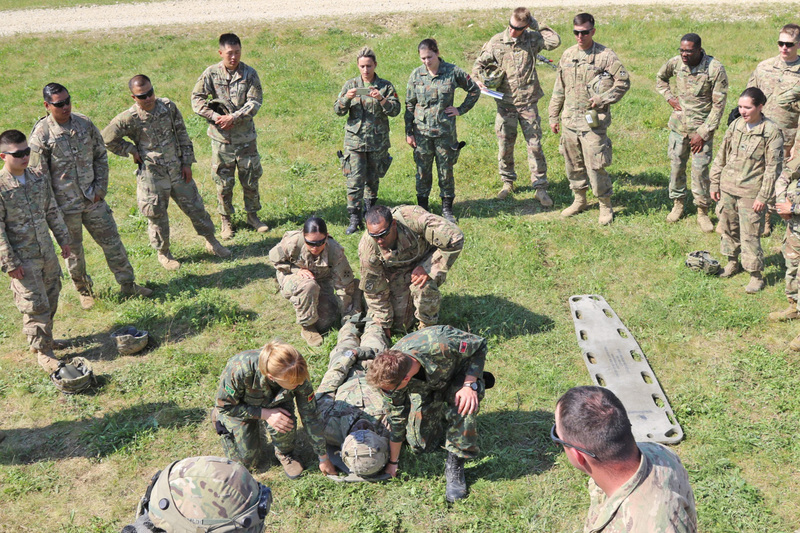 The training detailed the process of casualty care from the battlefield to the hospital, where initial care is either self-aided or treated by a battle buddy. Combat medics provide first aid before a patient is medevaced to a Role 1 facility, such as a battalion aid station. “A Role 1 is a facility that has a physician or a doctor and a medical team who provide medical care to stabilize patients. A Role 3 is hospital care,” said Howard. Aviation combat medics from 1st Battalion, 501st Aviation Regiment, 1st Armored Division Combat Aviation Brigade, who are serving as part of 10th Combat Aviation Brigade’s Atlantic Resolve rotation, also participated. “We get so used to doing things the 3rd ABCT way, so it’s a great thing that we can combine our personnel and assets for the mission. I’ve participated in Atlantic Resolve but never on this scale before. Too many times you hear about the combined training and don’t always get the unique experience,” said Howard. As the 3rd ABCT leads more than 3,000 soldiers, of which about 2,100 are actually in the brigade, to the field for a nine-day force-on-force training scenario, the multinational contingent will have plenty of opportunities to test casualty care through defensive, offensive and stability operations. “We will have that interoperability out there,” said Howard.